number of nominations does not exceed the number of vacancies. indicate the number of nominations. consultation, closing on 19 May 2019.
survey and supporting evidence researched by the volunteer Steering Group. it may be viewed here. Feedback is sought via an online questionnaire. 5.30 pm, Sat 9.00 am - 5.30 pm, Sun 10.00 am - 2.00 pm. to 999 and from the pub. location and a power supply for the cabinet in which the PAD is housed. cardiac arrests in the UK. We are hoping to arrange training in the use of this equipment and details will follow in due course. training video by the British Heart Foundation, here, or St Johns Ambulance, here. roundabout, together with a number of Ashford industrial estates. technically incorrect to refer to this as a “lay by” as it is a through route used by buses). other bodies including Westwell Parish Council and the SLRA. on KCC & ABC finances. this month (March 2019) to make the trial area permanent to ensure continuation of enforcement. However this is dependent on the response from DfT. Notice of Adoption of the Ashford Borough Local Plan 2030. The Notice may be viewed here. M20 East bound to be re-textured to "reduce noise"
not anticipate that it would have any significant effect on traffic noise. there had been a decrease. noise". It is not stated what form the re-texturing will take. complete (w/c 25 March 2019). A copy of the letter from Highways England may be viewed here. adopted, may be viewed here. despite wide public opposition to the scheme. of plasterboard. Asbestos disposal will remain free of charge. The Record of Decision document may be seen here and all details of the issue may be seen here. debate on the issue, is below, dated 27 January 2019.
delays or cancellations of the implementation of noise abatement measures. campaigning for noise reduction measures on the M20 in the vicinity of this area. during the later part of the monitoring period will be reduced as it occurs in the school half-term holiday. install noise reduction measures, such as resurfacing of the carriageways. decision may be viewed here. year-long events plan, with each month having an event/campaign/initiative. Refill sticker in the business windows. See https://refill.org.uk/. them to join the fight. These action days will take place between March and June 2019.
amy.casey@ashford.gov.uk by Monday 18th February. 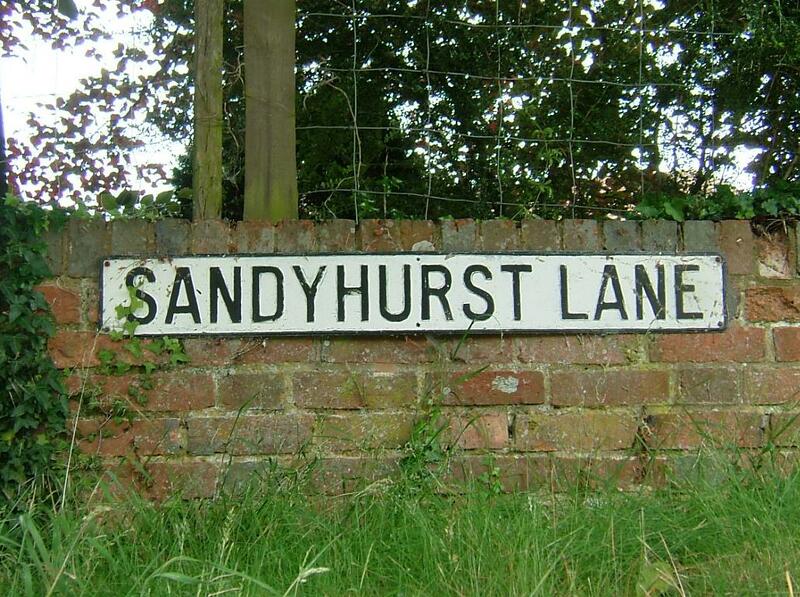 Nyali, 354 Sandyhurst Lane. Full details are available here (search for application number 18/01658/AS). The reply from Damian Green may be viewed here. from the pub when open. Sandyacres and the Iron Room need maintenance and are out of service. England to bring forward their long term plans to re-surface the M20 in our vicinity with 'quiet' tarmac. road locations, supported by a special £39 million fund. government press release about the Highways England programme may be viewed here. plasterboard. Asbestos disposal will remain free of charge. to council sites which charge; people switch to commercial disposal such as hippo bags, skips etc. tipping and a further 4 authorities reported an increase “in line with national trends”. materials at Household Waste Recycling Centres was carried by 9 votes to 2, with 5 abstentions. doubt that it will be to introduce charges. The full debate is available as a video on the KCC website here. School to the start/finish in Lenacre Street. The official road closure notice may be viewed here. view to ensuring that they have adequate coverage by marshals to facilitate access. Council (ABC). This is application number 17/01613/AS. planning committee meeting on 18 July 2018 (application number 18/00413/AS). are, as yet, no appeal documents to view. Corner, Westwell Lane. Full details are available here (search for application number 18/01729/AS). submitted may be viewed here. here (search for case number 18/00022/GDPE/AS). After several years of preparation, the Ashford Local Plan 2030 is now ready for adoption. Corridor sites, one of which is Land East of Hothfield Mill. The full text of the Inspectors’ report may be viewed here. 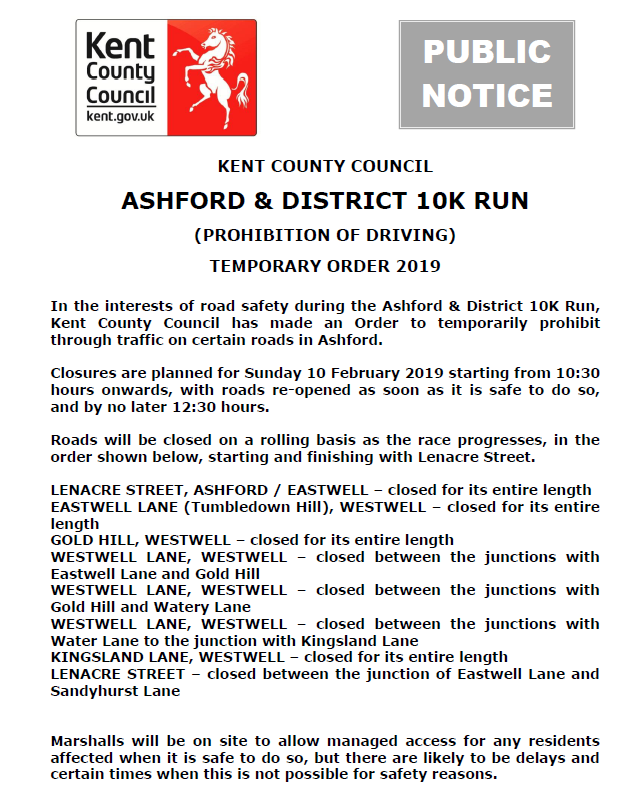 The annual 10k run is scheduled to take place on Sunday 10 February 2019. Details of the event on the organisers’ website may be seen here.